Mike Marlo from Flying Mutts Rescue contacted Steve about flying four puppies up to the rescue, Bandits Place in Connecticut. There were two sets of two puppies, four pups in total, coming out of Halifax County SPCA near South Boston, Virginia. One set was found abandoned and the other was owner surrendered. The plan was Steve and Pam would fly the first leg from Danville, Virginia to Georgetown, Delaware where we’d meet Mike and he would take the puppies the rest of the way to Massachusetts just on the Connecticut border. Two of the pups were soft black Bloodhounds about 10 weeks old and weighing approximately 15 pounds each. The other two were Labrador mixes, one black, one tan, again about 10 weeks old and weighing approximately 10 pounds each. And boy, were they all cute. Since we had to keep the puppy separate we contacted our wonderful volunteers at Pilot.dog and asked for one to step up and help us to take these puppies to Georgetown, Delaware. Courtney quickly agreed to help with the flight. She’s had experience in small planes and most importantly, she loves dogs. This was her first flight with us. On Saturday, September 24th, Courtney met Steve and Pam at TACAIR, at Raleigh Durham International Airport early in the morning. The weather was beautiful in Raleigh. We made the 30 minute flight flew to Danville, Virginia to meet Kris who was picking up the dogs at the Humane Society. Everyone immediately fell in love with them! There’s nothing to get your day going right than meeting a flock of adorable puppies. I’ve never seen black Bloodhounds before but they have to be one of the most stunning pair of dogs I’ve ever seen. I just fell in love with them. They are gorgeous!!! The black sheen of their fur and those long droopy ears, what’s not to LOVE? We tethered them in the backseat under the car of Courtney who was awesome with them. When they weren’t asleep, she got to love on them. Loads of hugs, cuddles, and petting. The Lab mixes were the girls and they were Lily, the tan one and Josie, the black one. I had the good fortune of having them tethered with me up from next to Steve. These little bundles of joy fell asleep shortly after takeoff and slept on my lap most of the way to Delaware. Luckily when they did wake up it wasn’t at the same time. Josie had a crush on Steve. She wanted to get to him so bad. She would put her head on his arm and sleep a little and when she felt he wasn’t paying enough attention to him she would bat at his arm with her little paw. If he still ignored her she would start chewing on his shirt sleeve until he turned his attention back to her. She would just stare at him as if he was the greatest thing she’d ever seen. The sight of her looking at him really tugged at my heart. If I could have, she would have come home with us. I don’t think she would have ever left his side. Clouds started rolling in as we flew closer to Delaware. Boy were we in for a shock when we got out of the plane. Us Southerners with our shorts and short sleeves, it was chilly up there! Everyone had sweaters and pants on. Mike and Karen had just arrived before us at the wonderful Delaware Coastal Airport (KGED). We have a few favorite airports to go to and this is one of them. The crew there at Georgetown Air Services is awesome and always remembers us. We all went into the airport restaurant for lunch. Yes even the puppies went with us. You want to get loads of attention, come into a room carrying 4 puppies and everyone stops what they are doing and oooooh’s at you. We went out onto their patio where the dogs could play and we wouldn’t be so much of a distraction. The pups had a blast and we all got to eat some good food and the ability to sit and talk to new friends and old ones. People would come out and ask if they could play with the pups or have their pictures taken with them. It’s always so much fun when you travel with a dog. It’s true what they say, dogs are chick magnets! Women of all ages came out to see the pups. Finally it was time to say goodbye to Lily, Josie, Dan and Matte. It’s always so hard to say goodbye. There is just something about looking into those big brown eyes knowing that you’ll never seen them again is just so painful. But at the same time you know they are going to a place where someone will love them and take care of them. We loaded the pups into Mike’s plane and off we all went on our separate ways. Courtney and Pam took a little nap on the way back, it’s funny how tiring these trips can be. Not just physically but emotionally too. Luckily for Steve he had autopilot and it was a pretty uneventful flight home. Back in Raleigh we said our goodbyes to Courtney and Steve and Pam put the plane away and then went off to see their own dogs and snuggle down with them for a night of TV and snoozing. Mike and Karen landed and met Liz from Bandit’s Place. Liz is currently looking for permanent homes for all of them. And tells me that they are all doing great! Josie, the little black lab mix already has an adoption application for her and Liz has just started showing them on Bandits Place Facebook page. So if you looking to adopt in the CT/MA area these babies are available. Courtney was a volunteer with us for this flight. You can volunteer as well if you click here. She was kind enough to share her impression of her experience with us. 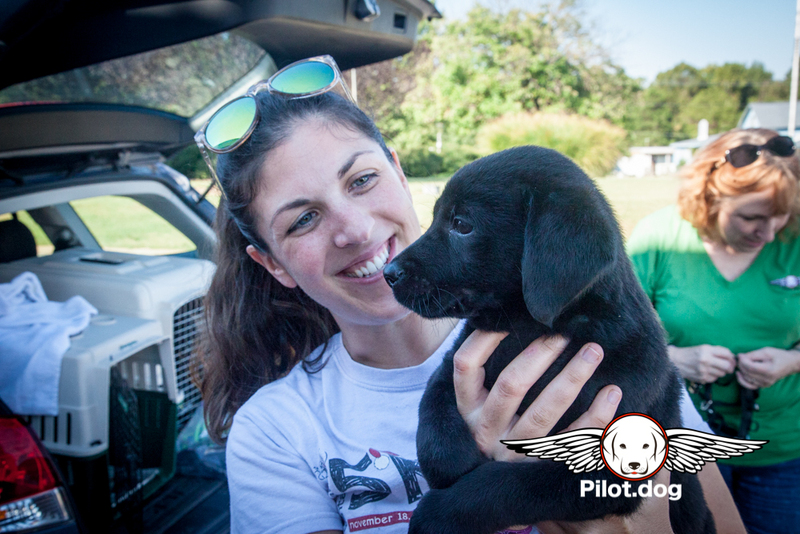 Courtney said, “I love how you guys do your best to treat the dogs as passengers: making sure they are comfortable, have treats, and feel secure during the entire trip. I understand why some may want/need to put the dogs into a crate, but given the unusual nature of flying, I think its awesome that you have found an alternative and others should look at the success you have with your alternative method of giving the pups a safe and smooth ride. If you’d like to see lots of photos from this flight, just click here.